gohemiantravellers | Travel is for the Gohemians of the world. It's all about the GoGo not the staying put. So let's GoGo! | Advice and inspiration for travellers, adventurers and general go-getters | Look beyond the 9 to 5 and be happy, be a Gohemian! A little update guys to let you know that my birthday treat to myself this year is to get a new website! YAAAAAAAAAAAAAY! So I am keeping up my promise to deliver lots of new features and most importantly a better site for you. So it may be out of action for a while (but behind the scenes I’m writing furiously and doing lots of batch posts all ready for when the tech-y side of things are complete! Hope you’re as excited as I am! This is going to be AWESOME! So it’s time to get on the bus again and head up north to see more of glorious New Zealand. I decided to start north for no other reason than I felt like it, and I wanted to try to see as much of the country as I could. There is lots to see south of Auckland so I decided I wanted to prioritise the north before heading down that way. And I’m so glad I did. 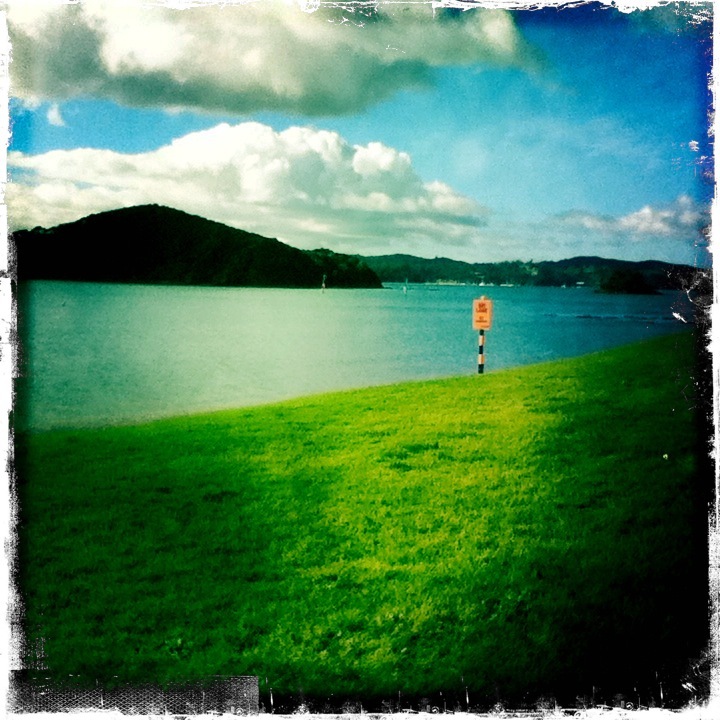 Paihia is beautiful! I arrived on a particularly sunny day which really emphasised the beauty of the surroundings. The view from Paihia Wharf is breathtaking, with the Bay Of Islands just in sight and the sun beaming down on the shore. Even on the coldest day, it’s hard not to be impressed here. And another pull-factor here, is the amount of stuff you can do in this area. 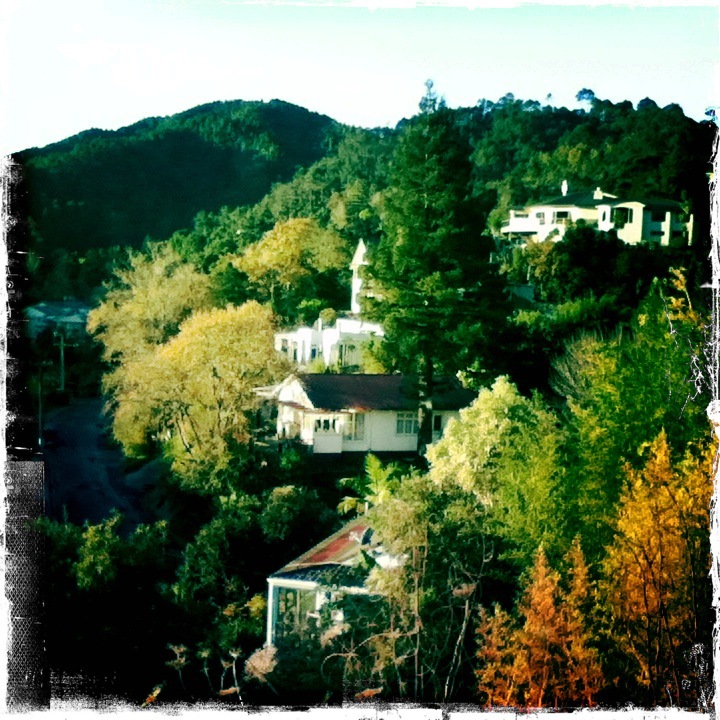 Coming from a sleepy-town like Whangarei to this beautiful place with so many activity options…I was a tad overwhelmed. I once again opted to stay in a YHA once again and it was a great move. The bus dropped me off just up the road from the hostel, I didn’t realise this until I got off the bus, but after wandering for 2 minutes trying to get my bearings, I stumbled across it – good times! 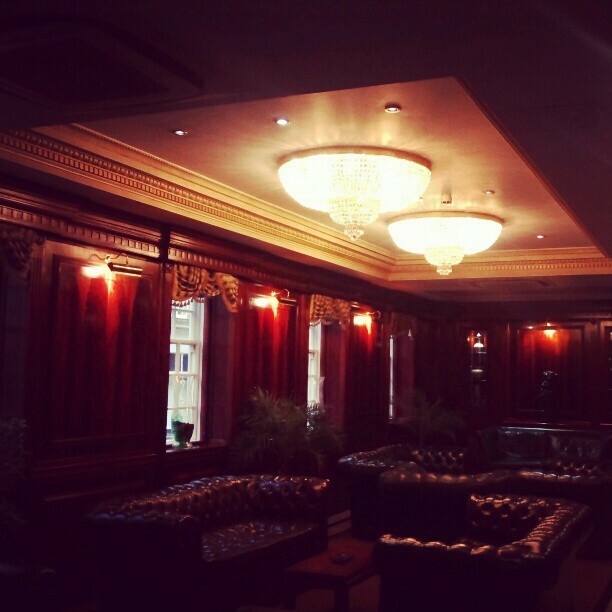 It was a nice place, very cosy, staff were great – once again, I really do recommend it. I just don’t recommend the room-mates I got HAHAHA. The room was empty when I walked in, so initially I thought I had the place to myself again – until I spotted this note on the bathroom door. Oh dear. Yup, I was stuck with a hypochondriac. Great. She was a little bit intense. I walked in and saw this eccentric-looking lady sitting in her beret on her bed and she explained to me she was staying in the hostel for a month to work on her novel. She was nice enough buit often a little bit snappy, but really after spending a bit of time with her I just realised she was lonely. It’s funny how people, who often seem like they’d really prefer to be on their own, just really want to be around a lot of different people. In YHA’s there are awesome sitting areas which tend to have a fair few videos lying around – Yes! You read me right, VIDEOS! It really is that old school). So a few of the nights me and one of the other girl’s decided to watch some flicks together. It was fun. In fact we got so excited about rewinding a tape that it almost overshadowed the movie (what a novelty eh?). But anyway writer lady just really wanted to watch some films with us but she had picked out really serious, intense movies whereas we kinda just wanted to watch some comedies. Bless her, she was just a little bit full-on but you will realise, it is these strange people, that you will meet, who make your hostel stays so interesting. I met another awesome British girl who was very fun to hang out with and then I ran back into Thjis (my friend from the Whangarei YHA). I promise you if you are concerned about feeling lonely while you’re away, I can promise you – DO NOT WORRY ABOUT MAKING NEW FRIENDS WHILST TRAVELLING, its easy-peasy to meet new people. Remember: EVERYONE is in the same boat as you, they all want to feel welcome and at home in a strange place. Once you’ve made some new friends you will want to get out there and get exploring. I was given a map of the area by staff at the YHA and from this I could see I wasn’t far from the Waitangi treaty grounds. So I decided to take a stroll to it – it was probably a 40 minute walk away. And what a beautiful walk it was too, I have honestly never seen such beautiful scenery in my whole life. Walking along the waterfront was just bliss. I love walking on my own, at my own pace just taking it all in. You cannot beat it. Because when you travel with someone else, you don’t ever do things your way – you do them in a compromised way. DOING THINGS YOUR WAY IS OK, SO MAKE THE MOST OF YOUR OWN TIME. Walk your own pace, stop at things that you want to really get up-close to, listen to music as you make your way and sing your own song. 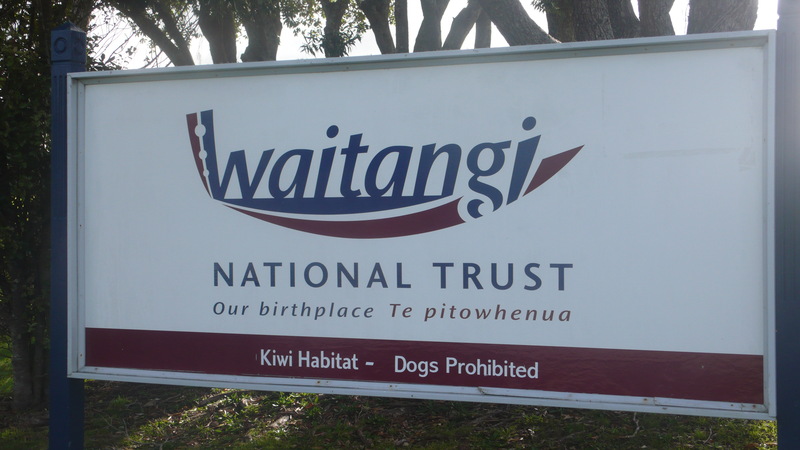 The Waitangi Treaty Grounds are really worth a visit, it’s really fascinating, and as you already know, I believe that if you’re going to go to a country you may as well learn about its history while your there. 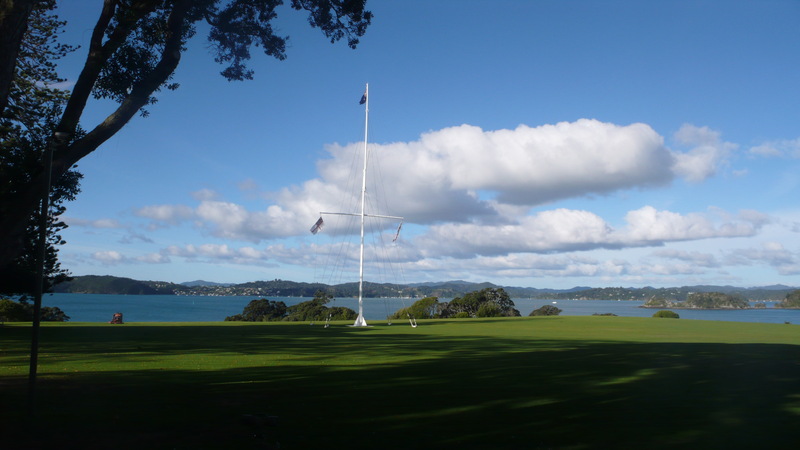 The Waitangi Treaty Grounds is basically the heart of the country, it is New Zealand’s most historic site because it was here, on February 6th, 1840, that the Treaty of Waitangi was first signed between Maori and the British Crown. So I think going north from Auckland is a fine idea, get a sense of this wonderful country’s past. 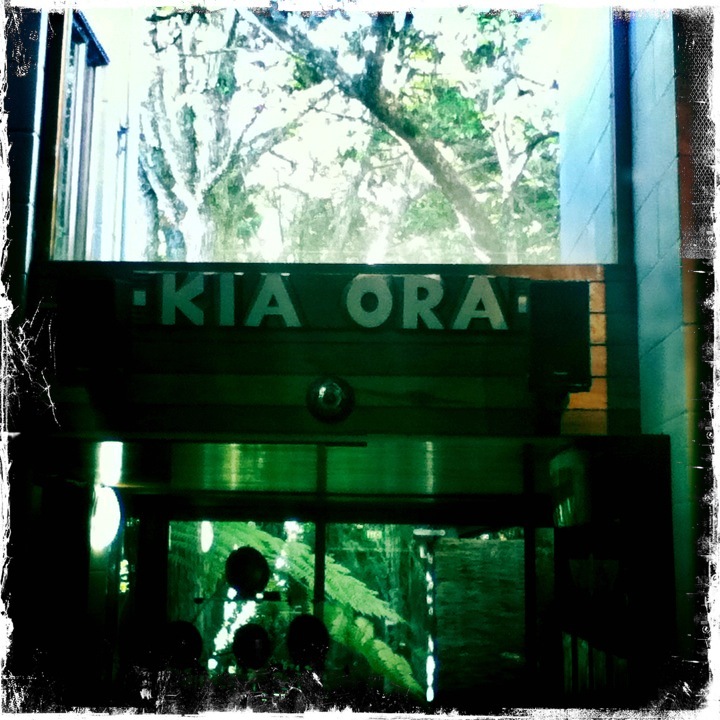 As soon as you arrive in any Kiwi airport you will be greeted by the words ‘Kia Ora’, from there on you will see place names and places of interest with interesting and often un-pronouncable Maori names…so then I think it’s good to know all about how the agreement between the Maori’s and the Western World came to be. The grounds are part of a 506 hectare National Trust Estate and on a beautiful sunny day, this really is the perfect place to visit. Walk around the grounds and be amazed by the traditional Maori carvings, etched into everything from ceremonial war canoes to the interior of a beautiful Maori Meeting House, to the beautiful scenery and wildlife that surround the area. But because Waitangi is really all about the meeting of two very different cultures, you get to see both sides of it. Take a walk on over to the Treaty House and you get to see how the other half lived in James Busby’s digs (New Zealand’s first British resident). Doesn’t it look just like a traditional English home? I bet the Maori people thought it was the weirdest thing when they first saw it. Nice though eh? I really enjoyed walking around Waitangi, I liked listening to the strange sounding birds outside, watching the historical video in the visitors centre and sitting in the beautiful Maori Meeting House and thinking about how much it reminded me of the Care Bears Movie II hehe! 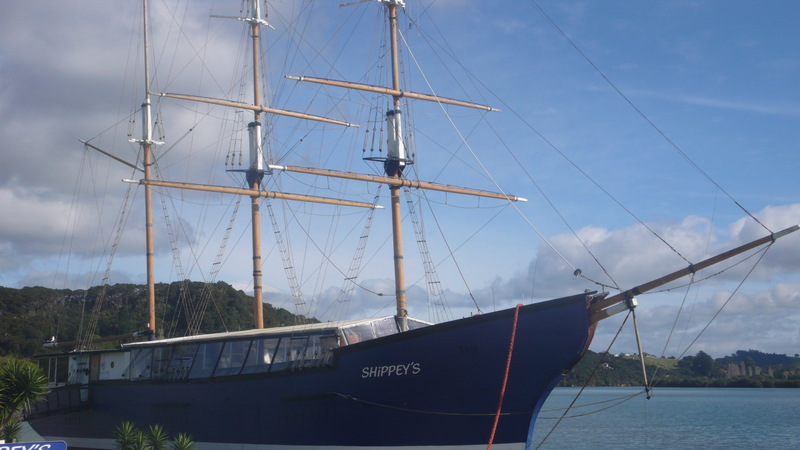 So once you’ve soaked up the historical facts of Waitangi it’s good to just get relaxing, so how about on your way back to town, nip into a ship and get some fish and chips…I mean why not eh? Or should I say fish and Shippey’s hehe! On the way back I stopped at Countdown supermarket on Blackbridge Road to stock up on stuff to cook my first solo meal. To say I was excited, was an understatement. I’ve got to admit I got used to my partner mainly taking charge with cooking the meals, so this time around I was excited to get cooking what I wanted. However, food is much more expensive in New Zealand (and I’m not just talking in comparison to India and Thailand, even compared to Britain…it’s costly). So go for Value foods! I found value range pasta, yoghurt pots of tomato pasta sauce (more practical than buying a jar, in case you’re not sticking around for that long), I even treated myself to some very yummy Whittaker’s Chocolate…mmm. I’m totally one of those saddos who loves going to supermarkets, I genuinely get excited about just mooching around in them (especially when I’m abroad). The next day I decided to go to do the Cape Reinga & Ninety Mile Beach Tour, and I really recommend it!! It’s a very early start, so be prepared to get a good night’s sleep and for God’s sake DON’T BE LATE! I was about 3 mins late and as a result of that the guide on the bus took the piss out of me for the whole day! It was funny though, and having a surname like Black, meant this guy took great pleasure in shouting my name every 2 minutes! (Felt just like school all over again haha!). Even though our guide like taking the mick out of me, I still loved him! He was awesome! He was really fun and on a hilarious mission to beat the other tour groups to all of the main stops. He even took us down a restricted road so we could beat them! 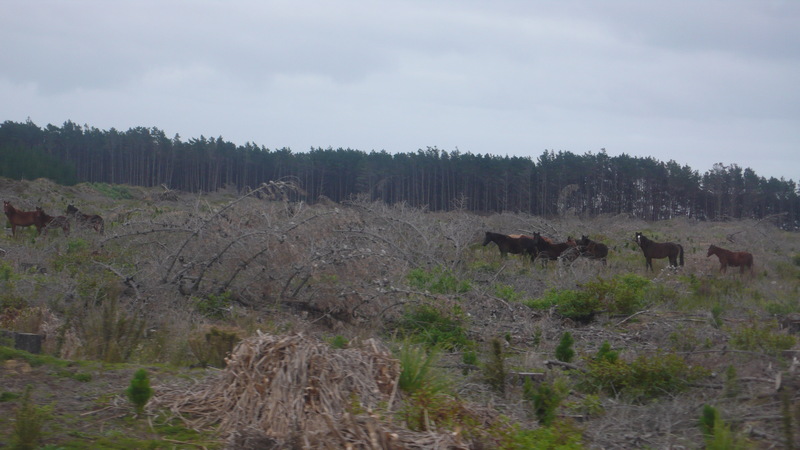 And as a result of that, we got to see some wild horses…AWESOME! I loved that he was willing to take risks to make our trip memorable! He was so great! I wish I could remember his name…he should be commended for his awesome work. He really was so passionate about his job and New Zealand as a whole. This was definitely not just a job to him, it was a lifestyle choice and that was so great to see and to be part of! He told us fun stories, Maori legends and then proceeded to take us on a hair-raising drive on the sand across the length of the 90 mile beach. The water was spraying up all around the bus, he was laughing away, we were smiling so hard our faces ached, it really was not your average bus-tour! Sandboarding at 90 Mile Beach…eeeeeek! As you can see, we got the opportunity to go sandboarding. Well, I’m going to disappoint you now because I chickened out. Oh I’m an adventurer alright but just not too extreme, so I wussed out and decided to watch, which resulted in more piss-taking from the coach driver – haha!Anyways I had a great time and wasn’t wet and cold like everyone else (secret win!). 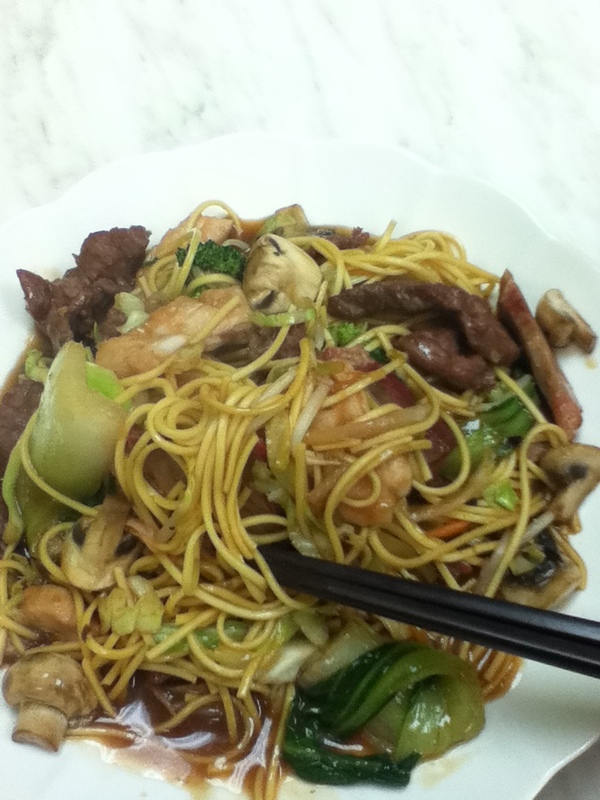 After that we had lunch (I’d bring your own lunch, as the buffet you can have costs much more). 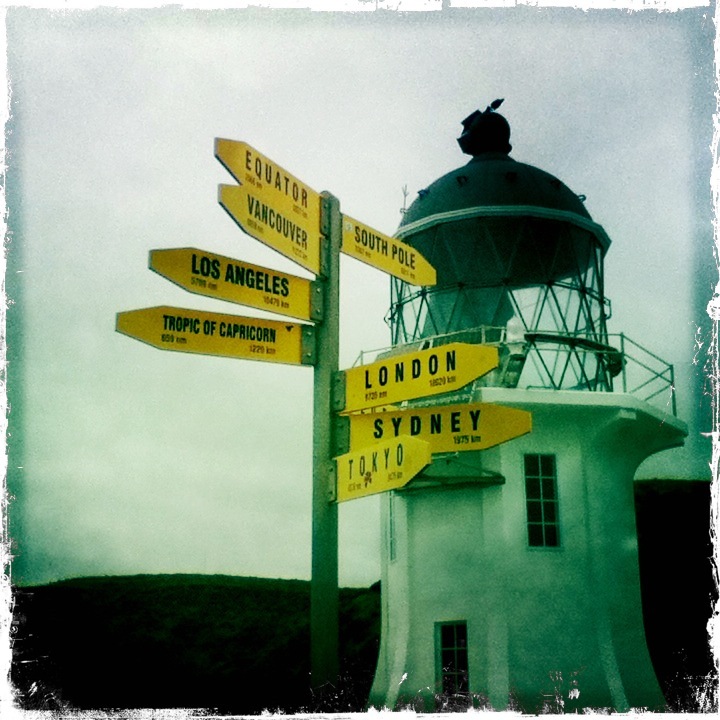 So once your fed up then you’re then ready to be taken to the very tip-top of New Zealand at Cape Reinga. 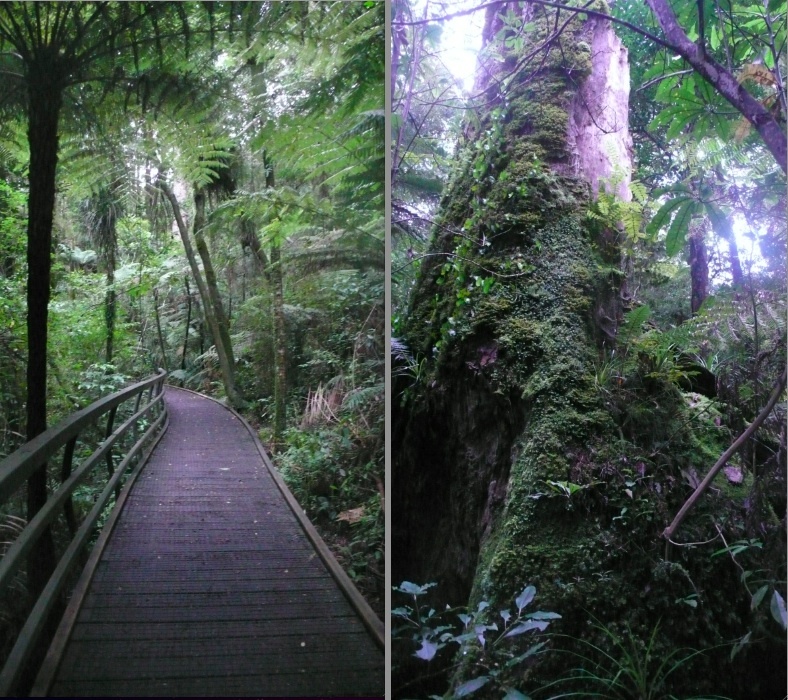 We then went to see the amazing sacred Maori Kauri trees at Puketi Forest. These trees are the largest I have ever seen in all of my life and are located in, what seems to be, a mythical forest…when you are in New Zealand, you begin to understand why Lord Of The Rings was filmed here…it’s just magical. Kauri trees were used for making traditional Maori canoes and for carving but the trees were considered sacred and very special, so the Maori people used to perform a special ceremony before the trees were cut down, to ask the Kauri spirit if they could use the tree. As you will learn when you travel to New Zealand, the Maori people greatly respect nature and everything that is created in nature there, is founded from a wonderful legend. I’ll leave you on that note my lovelies, anyone heading to NZ soon? 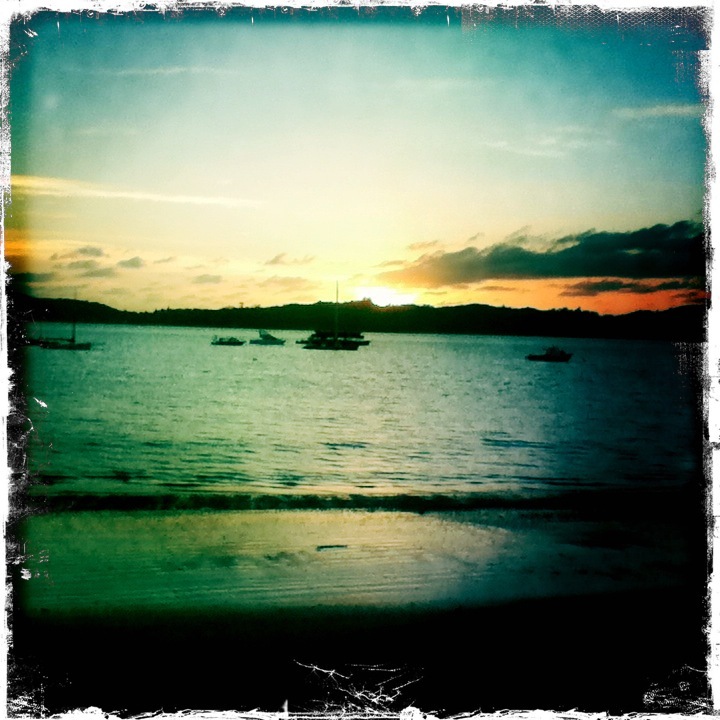 Any thoughts on Paihia and the Bay of Islands? There is sooooooooo much to do there, I only touched the tip of the iceberg. So go there and get adventuring my loves! Contact me on Facebook, Twitter and Pinterest please! I miss you! 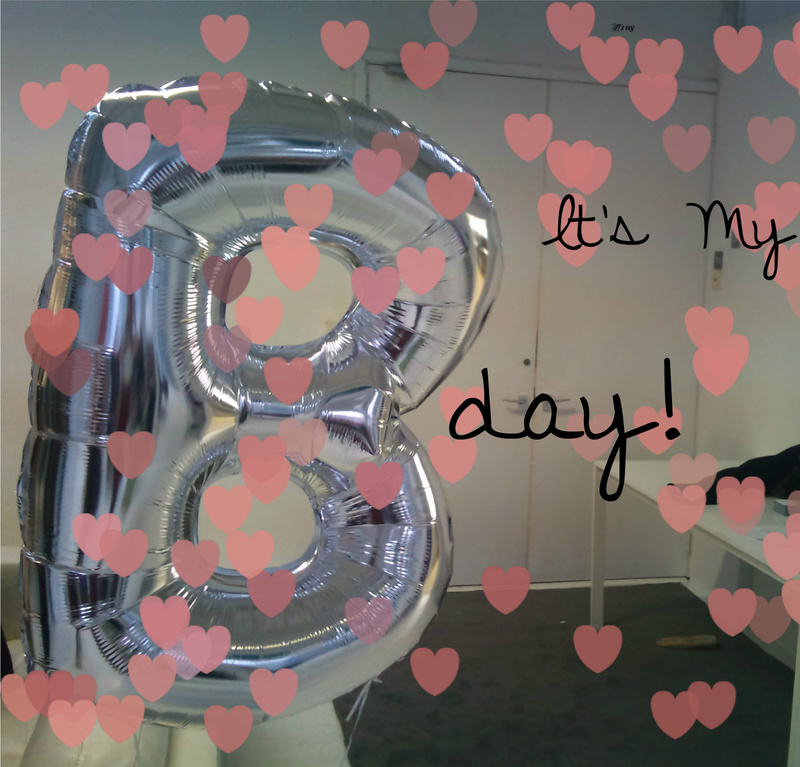 I graduated from The Blogcademy with flying colours! How exciting is that?! Well I have to say that it was officially the greatest weekend I’ve ever experienced! I have NEVER in all my days, felt so inspired or excited in my life. 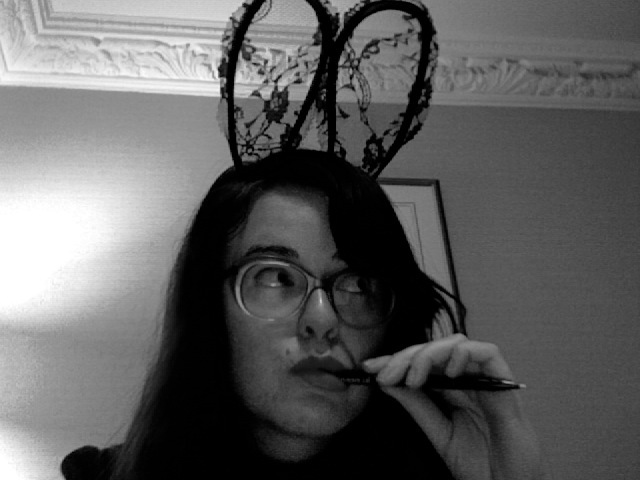 My head is jam packed with ideas, my notebook is full and my head is now covered in sparkly bows and bunny-ears (it’s a whole new me let me tell you!). So that’s why I decided to go all out and join the other Blogcademy gals in making a video to sum up how the classes made me feel. I mean did you see Emily’s Thank You Vid???? OMG! Emily runs an awesome blog which previews her very cool pop-up photobooth (I think EVERY party should have one of these and I also definitely think EVERY party should have an Emily in a Unicorn onesie jumping around!). Don’t you? She is all kinds of awesome! Isn’t she the cutest! Xandra’s blog focuses on how to look and feel fabulous without having loads of stuff (boy could I do with some tips from this girl!). I could go on and on about how amazing my fellow Blogcadets are…Jessica’s post with her A to Z of the classes was so awesome! 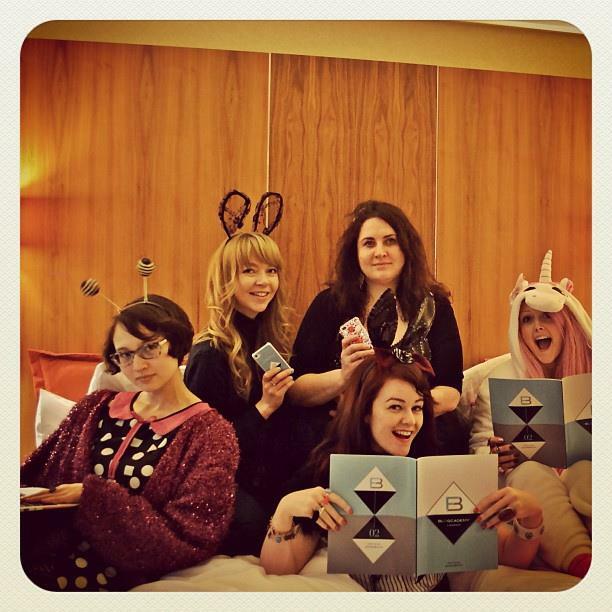 Amy’s post about how The Blogcademy makes your dreams come true, was so right! Honestly all of these girls are amazing….I will be featuring so much more from my new blogging pals so soon. So as Emily and Xandra so excellently summed themselves up in their videos, I decided to show you guys the real Gohemian in me, to show my gratitude for my Blogcademy experiences. That’s me in a nutshell….A fancy-dress loving, pin-up princess who loves nothing more than a good giggle, a handful of glitter on my face and something colourful sitting on my head. I can’t believe I haven’t done more bits in front of the camera really. If you remember I tried a bit singing in my first video post hehe…that was funny. I also did a great 8mm film shot of my breath-taking moment in front of the Taj Mahal. But you can now expect much more film footage from me in the future. I did a fun bit of filming as I walked through a forest in New Zealand, which I’m very excited to put up and show you. So as you can tell I learnt that VIDEOS ARE VALUABLE TO YOUR BLOG. I have to agree with Gala, when she explained that a video really offers that little bit extra to your readers, you get to see a personal insight into that writer’s life. So I am very excited to show you that little bit more about me (and mainly how much of a weirdo I am haha!). My fabulous friend Becca (who is my new blogging-partner in crime for our new Fancy Dress obsession blog GypsyPixiePirate.com) helped me film that clip – ain’t she a sweetheart?! We randomly did it in 15 minutes, at her house, on my lunchbreak. I think it was the most fun, rapid dress up challenge I think I have ever done! And remember I did the Halloween Hat Trick for the past 2 years running (2011 and 2012). 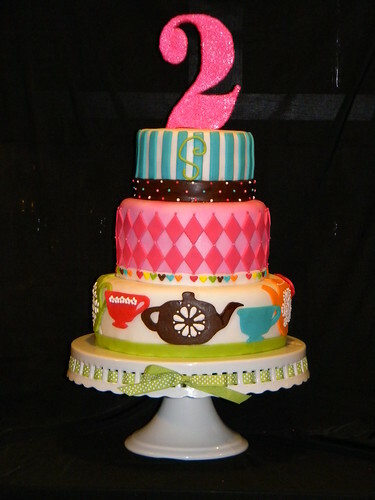 Anyway we are so very excited to get our blog set up but in the mean time check out our Twitter and Pinterest pages. 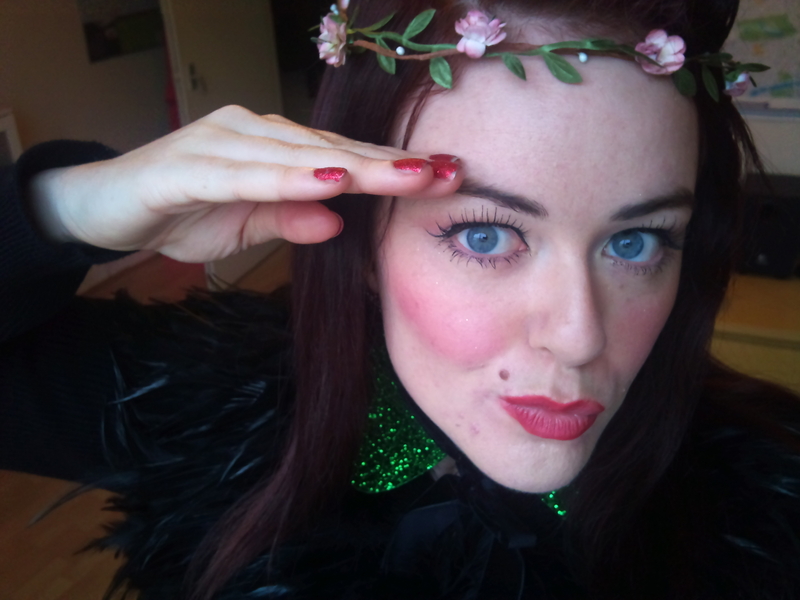 But back to The Blogcademy, I also learnt how to brand my blog effectively, thanks to Shauna’s expert tips. And the greatest thing to take away from that was the importance of CONSISTENCY throughout social media platforms. You have to do as the professionals do and use the same pictures, names and taglines for each site – to allow yourself and your brand to become recognisable. Makes sense right? 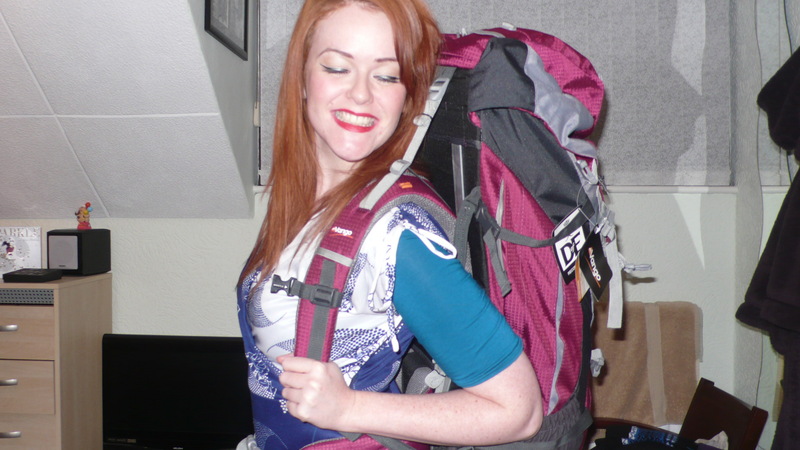 …And I realised the best way to describe myself is, as “a pin-up girl living the budget backpacker dream”. As I travelled, I loved trying to find ways to make my make-up stay on, even in the intense heat. I loved to make sure I looked cute and glamorous, whenever I could. I loved finding cheap yet stylish hotels to stay in (Thank you Agoda!). So from now on loves, you can hear tips from the new and improved Em, the pin-up gal with a plan! (I’m still working on what my catchline will be – so any opinions would be great!). I’m very excited to launch the new me and of course my new website! I’m leaving WordPress.com in favour of self-hosted WordPress.org. I am also going to be covering a lot more fun fashion tips, Continuing GT’s Loving of Late feature, as a weekly post. I’m also working on an e-book and various other awesome projects which will be covered in detail soon. So I endeavour to you, dear reader, a new Gohemian experience. From me you can expect a new professional website, lots more social-media feedback and fun, more videos and most importantly lots more content (at least 3 posts a week – minimum!). And that’s just to start with…I imagine a lot more is going to change and as always I would LOVE your feedback. Send me your feedback, I’d love to hear what you think. Use Twitter, Facebook and Pinterest too! (Social media buttons will follow soon on my new site – it will be so much better). I am so excited, I am so excited! I cannot even tell you! 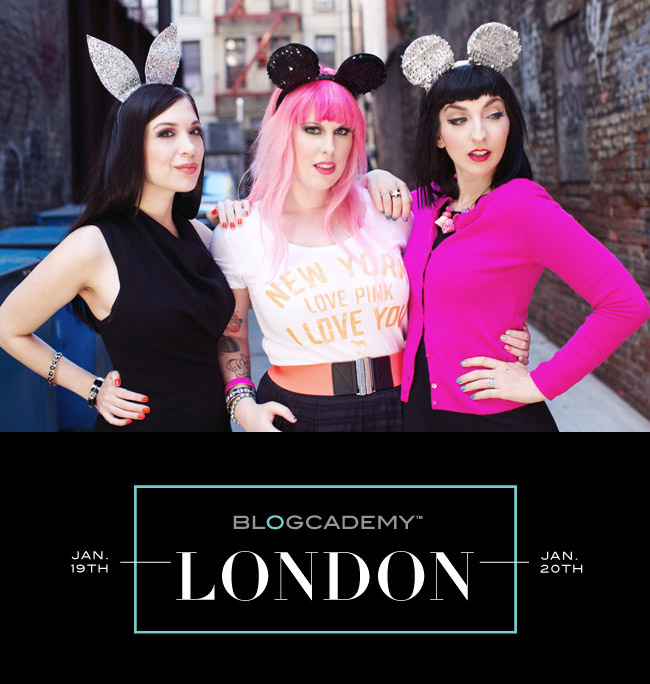 This weekend I am going to be taking part in the London Blogcademy weekend class! I don’t think I’ve ever been so excited about going back to school in my whole life. For those of you who have no idea what this is, let me enlighten you. 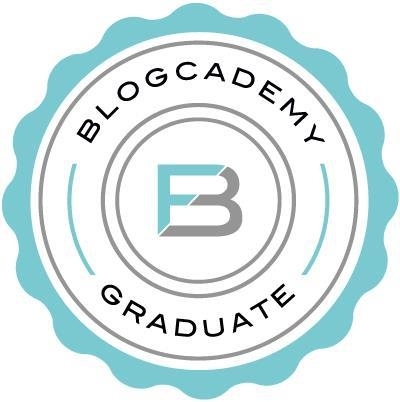 Blogcademy is an amazing 2 day course for writers who want to take their blog and brand to the next level. Taught by my favourite blogger and inspiration-guru Gala Darling I knew I wasn’t going to miss an opportunity to learn how to get my blog to a ‘Gala’ standard. Her book Love and Sequins was a Godsend for me, I used it as an inspiration to take my blog ideas further (especially her Blogging 101 chapter), and so now I’m going to be properly schooled by the lady herself! SQUEEEE! 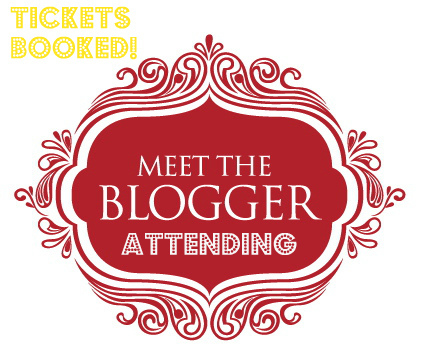 But it’s not only by Gala, as you can see, her two best friends and fellow blogging superstars, Kat Williams of Rock n Roll Bride and Shauna Haider of Nubby Twiglet.com, will be teaching too. I think they are the hottest headmistresses I’ve ever seen! I have been following Nubby and Kat through Gala’s blog for a while now and I mean what is not to love! Kat has inspired thousands of couples to ‘Do their Big Day the Rock N’ Roll Way!’ – I love that (Individualism is key to any wedding in my opinion)! 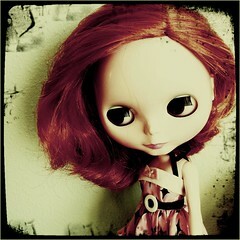 And she’s a kickass pink-haired British chick so naturally, I love her! And Nubby is one of the most talented designers I’ve ever seen, I love her adoration for monochrome and the use of shapes…and her dress sense is just to die for! Love, love, love! 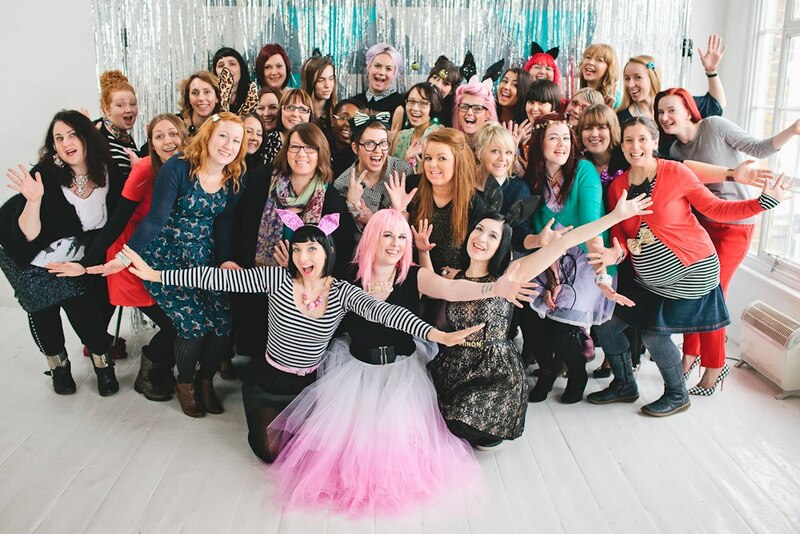 They are 3 of the most creative, bubbly and stylish ladies in the blogosphere, they wear bunny ears, glitter bows and mouse-ears on a regular basis and they have the best jobs in the world….inspiring us, they rule! So of course I am going to be there with bells on! 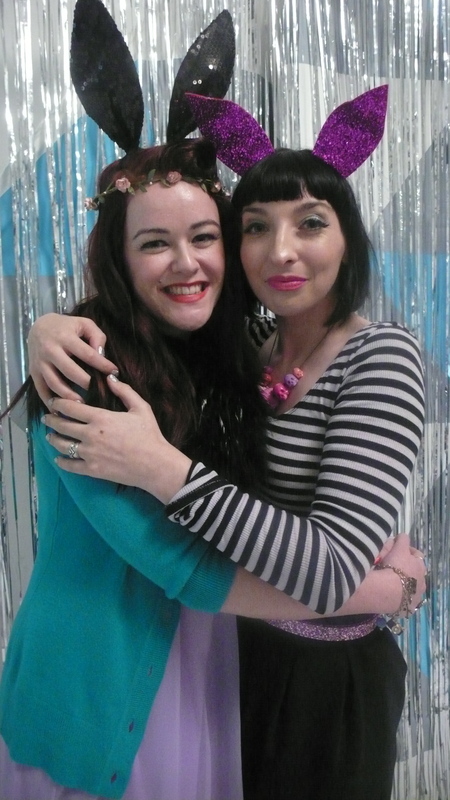 (And also sequinned bunny ears, Irregular Choice heels and red lipstick – you know just for good measure!). I wonder how Shoreditch is going to handle the masses of glitter, vintage cuteness and bunny-eared bloggers! Because 64 of us will be descending on Curtain Road Studios between Saturday 19th and Wednesday 24th Jan! Eeeeeek! I have had an impromptu few days in a luxurious London hotel prior to the big B. Me and my mom have been lying in bed watching Audrey Hepburn movies, taking bubble baths, hitting the shops and of course I’ve been blogging and sketching out many ideas. 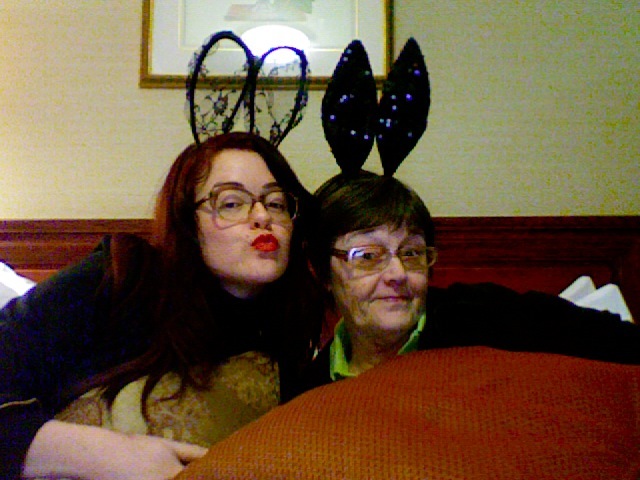 Me and my Mamma are getting ready for my Blogcademy debut! So it’s a very exciting time here at The Grange Fitzrovia (very nice hotel, I very much recommend it! ), there is a lot of blogging love coming from this 3rd floor room let me tell you! 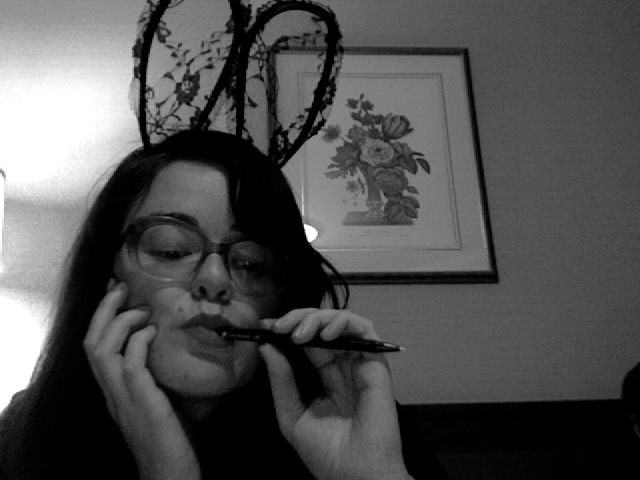 I’m a Blogcademy Bunny Girl! I swooned at the sight of the lobby…. But I haven’t just been feeling the blogging love in my hotel room hub though, the class’s private Facebook group has been wonderful to be part of. I have been connecting with fellow classmates and chatting about life, loves, blogging, inspiration and everything else in between. I haven’t even met these girls yet and already I think I’ve found some really nice new friends. So there you have it people, this isn’t just a course (or a good excuse to wear bunny-ears), it’s a real community in and out of the classroom. 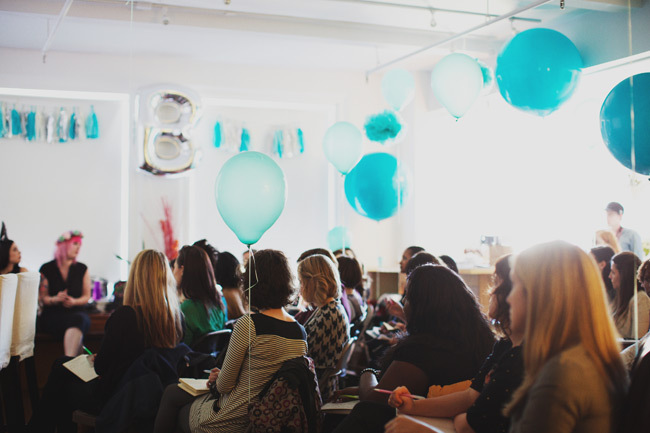 I’ve even had messages from bloggers who attended the NYC class and connected with gals who have now signed up for the LA and Portland classes. I mean, it’s amazing! I’ve experienced nothing like it before. I wish all my girlfriends were coming too because we really are going to have the BEST time. So should you be out and about in Shoreditch this weekend and on Tuesday and Wednesday next week and see masses of fabulous bunny-ear-clad, sequin-bow-wearing women walking around, don’t panic! 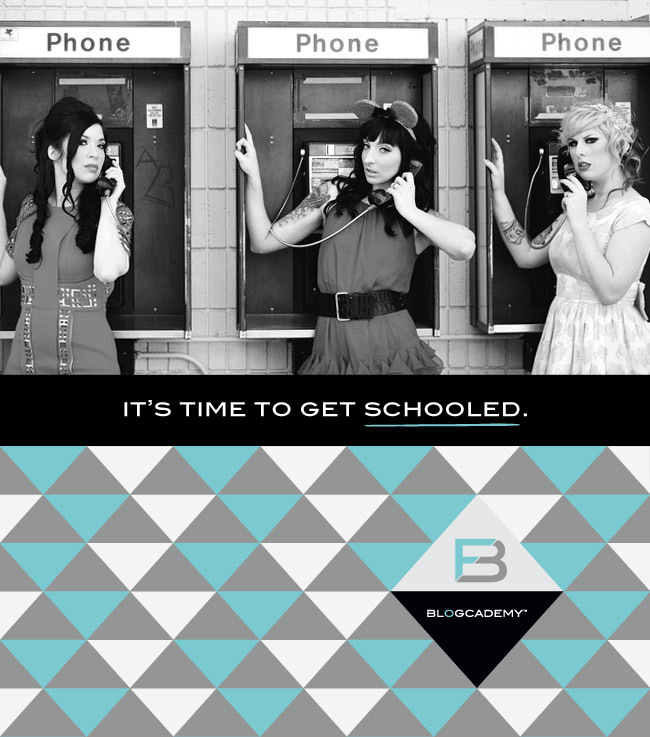 We are the Blogcadets, here in hipsterville to expand our minds and aiming to offer something new to the blogosphere. We are most certainly on a mission and I have never looked forward to something so much in my whole life. (Now I need to try and zillion outfits on to figure out what to wear hehe). Let’s take a look back at how I worked the backpack wardrobe while I was away. I wrote a long post pre-trip all about what to pack for an around the world trip and most of it made it in there but of course a few things didn’t. So let’s see what is ACTUALLY USEFUL for your world tour. You will find you will have to throw things away as you go along, so just do it! Get rid of them. Because you will definitely reach a point (especially if you’re a girl) where you are just dying to go shopping to get a few new things. But remember you will have to find the room in the backpack or chuck some things out to accommodate the new stuff. So just be aware of that, because if you find throwing stuff out of your wardrobe hard, this will be even harder. You get attached to your threads, especially when you’ve taken them half way around the world with you. There were some dirty shirts I had, which were totally beyond repair…and even then I was still sad to throw them away. Do not take light-coloured things. They are totally and utterly pointless. I packed a few white things – a t-shirt/long-sleeved top to wear in bed or on the beach to protect my shoulders – and as predicted, they don’t stay white for long, and no amount of soap seems to help. It seems dumb to take whites anyway, I know, but light colours reflect the sun. So instead, get a lightweight thin cotton, long-sleeved top/kaftan to wear on the beach but get it in a good colour. White may reflect the sun but Khaki green/red will probably be much more practical. 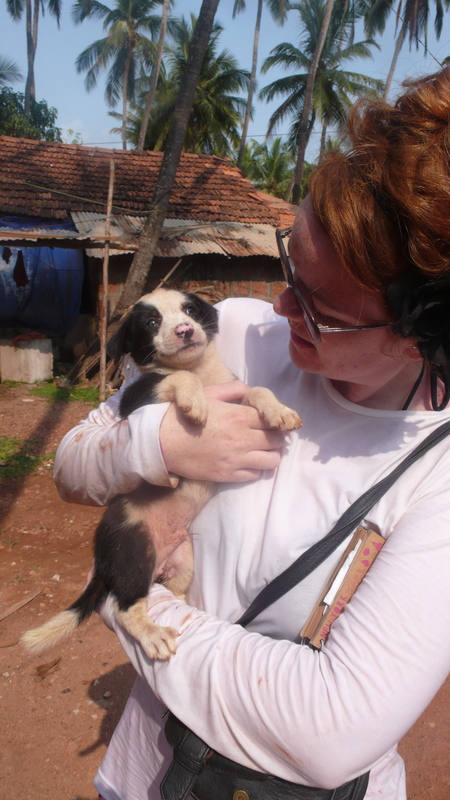 Also if you end up spotting some cute pups in the street and picking them up, it will result in a very dirty white top as I demonstrated – fail! I mean who can resist puppies?! NO-ONE! Maxi-dresses are great. I wore my maxi-dresses, because as predicted, they were super-light, easy to roll up in my backpack and kept me nice and cool. I was glad I only took 2 though (that was all I needed really – do not take heavy-fabric dresses – only light ones will do. I left the Grecian black heavy one behind and rightly so. No matter how cute it is, don’t bring it! I also wore my little polka-dot 50s number a fair bit too. It was a little sweaty to wear at times, the fabric is lovely and cool in a British summer but take that kind of floaty chiffon fabric to India and Thailand and it can stick to your sweaty back like glue. ICK! But I still wore it, I just saved it for more evening outings or cooler days. So whether or not is was a good idea to take is a bit questionable. 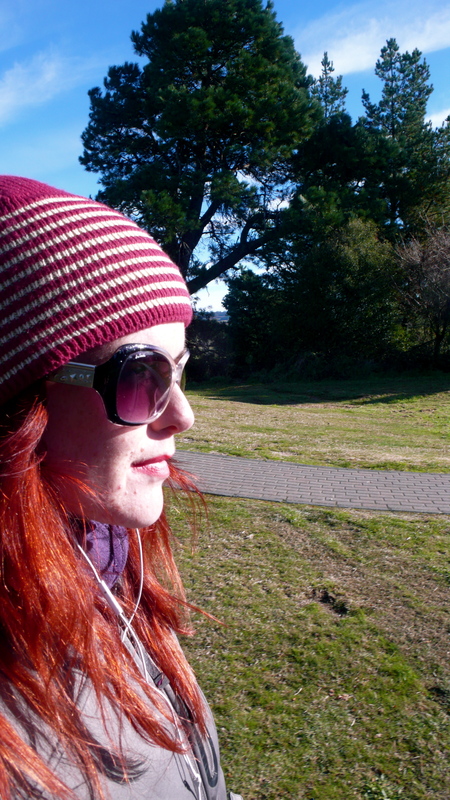 However I did wear it a lot in New Zealand over my jeans etc, so I was warm and layered up but still looked a bit girly. I was versatile, I’ll give it that. Vests and shorts and sarongs are also very useful. I took 3 vests which was pretty perfect (I actually think all you need – you don’t need t-shirts, maybe just that long darker coloured kaftan I mentioned earlier, for the beach and bed). Also I recommend adding a warm long-sleeved top if you are going to somewhere cold along to way, I took my thermo Tog 24 top and that was great for wearing out in the cold and in bed, especially because it’s designed to let your skin breathe. I will give credit where it was due, there were some items which were handy to take but still hardly worn….like my mosquito-repellant combat trousers for example. I wore them a few times in the hot countries I visited and then a bit more in the NZ but that’s it really, which proves some travel-designed things just don’t cut it. If you wouldn’t feel comfortable wearing them at home, why would you feel comfortable wearing them away? They came in handy when I needed something longer to wear but really, I wasn’t all that keen on them (and they kinda made me come out in a rash). So the lesson there is, wear things in advance of your trip and see how you get on. So looking at that list you can see really how little you need in reality, next time around I will pack very differently indeed. I bought all of that on top of what I already had and I also added 2 Indian shirts to my collection after Dan bought them only to find they didn’t fit. So basically I had way too many tops! But I didn’t want to throw anything away. However those guys shirts were great for me, they were perfect to wear over my maxi-dresses to cover my shoulders. So my tip for tops (hehe), just take vests and get any other bits while you’re out there, that’s all you need really. 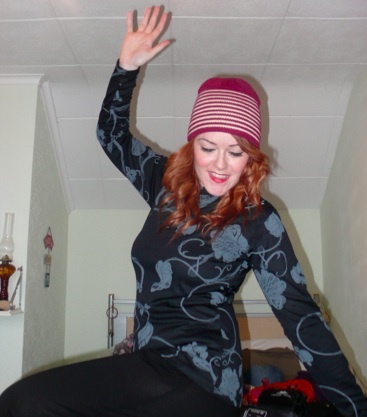 And now, just for fun, I thought I’d embarass myself by showing you my worst outfit pictures….oh lord. Some days you just grab the first thing you can find from your very deep backpack and chuck it on and well (sometimes) it really isn’t the best idea. HA HA! So what are your must-haves for backpacking? What could you never leave behind? What were your packing regrets? Tell me on Facebook and on Twitter. 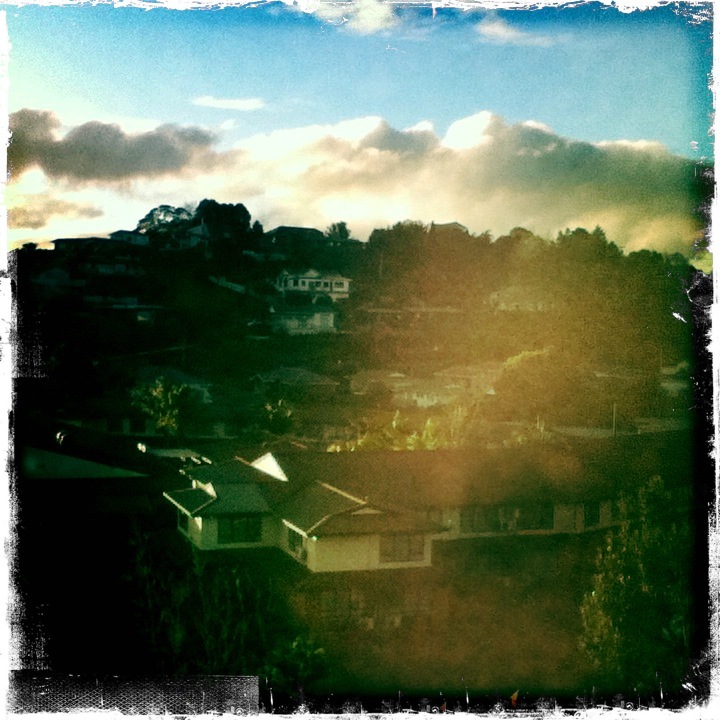 Arriving in New Zealand was an exciting and yet scary time for me. I had decided to do some solo travelling as part of the whole experience and it began as soon as I landed in Whangarei. You will remember that our first stop in New Zealand was in Auckland, well, Me and Dan spent 3 days together there to get our bearings…and then we decided to part ways for a while. 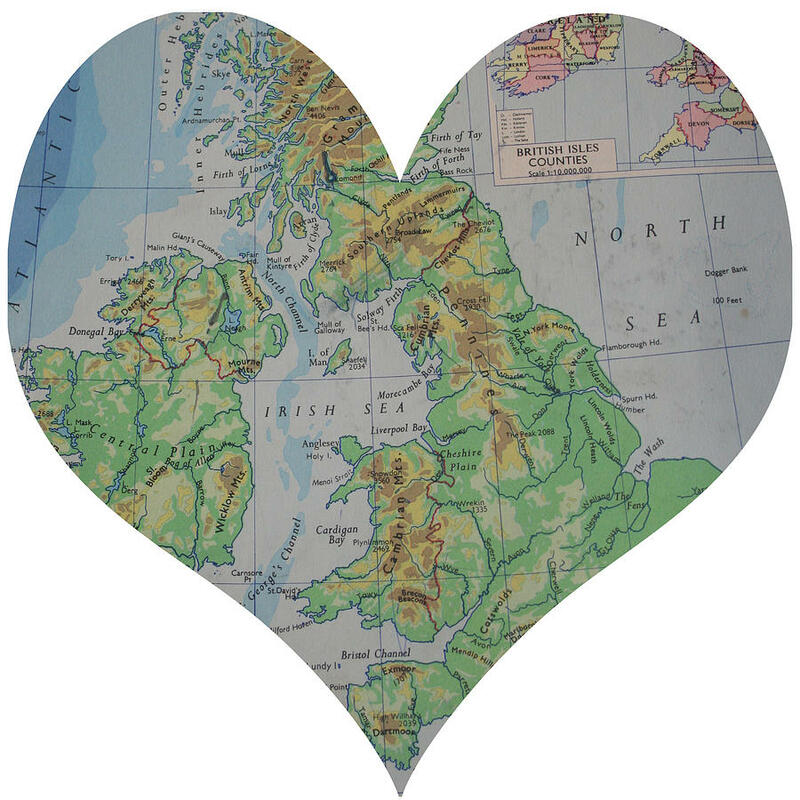 I will tell you now, it wasn’t easy but it’s the best thing you can do as a travelling twosome – HAVE SOME TIME APART! One half may love it, the other may hate it, but if it’s something you need to do – then its got to be done. Because to travel solo, is a very exciting thing indeed. Travelling by bus was really exciting and very spontaneous which I loved – I think all the rest of our travels had become a little ‘too well-planned’ at times (it’s so easy to do that your first time around), so this kind of travel option really gives you some freedom from all that. The journey was only a few hours long, but I was so excited. I’m one of those sad people who gets really excited about going on journeys. I think it’s true that life is more about the journey than the hypwe of the destination. I love taking in the scenery, reading my book, listening to my tunes and taking photos. My favourite thing is watching the world go by whether I’m on a train, bus or driving in a car. It’s like I was born to travel, going on adventures just just suits me down to a T – I guess that’s why I’m a Gohemian eh? So I just put my travel playlist on and enjoyed the ride. Nothing prepares you for the beauty of NZ, as soon as you get on the road, the green hills roll out in front of you, along with the acres of lush farmland, mighty lakes and rivers which are all dotted with specks of wildlife peppering the countryside. It’s so breathtaking. I was planning on doing loads of reading on the journey…but instead I just ended up gawping outside at the view. Actual window-licking occurred here hehe. When I arrived, I was amazed at how small Whangarei was, but it was comforting to be in a homely little town for a change rather than a big metropolis. But even though I was in a little town, I still felt a little bit lost though. I had printed a map off of the YHA I was staying at, but it seemed to be pretty far from the bus drop-off point and I realised soon enough that I had no idea how to get there. I was so used to someone else helping me find where we had to go, I was suddenly feeling a bit bewildered. But rather than that feeling like a negative thing, it felt exciting. I was creating my own journey. So rather than panic, I asked a lady who was there picking up her friend, for directions and the rest was history. I got my first taste of Kiwi hospitality right there as she very kindly gave me a lift straight to the hostel. Everyone had told me how friendly Kiwi folk are but nothing prepared me for that. She just instantly took me under her wing and helped a stranger out, and for that I was eternally grateful. It just proves if you don’t ask, you’ll never know and I promise you, there really are some great people out there, you’re just yet to meet them! I felt immediately at home in NZ, lovely people, a climate similar to home, lots of nice food and a very interesting culture – I was loving it so far. 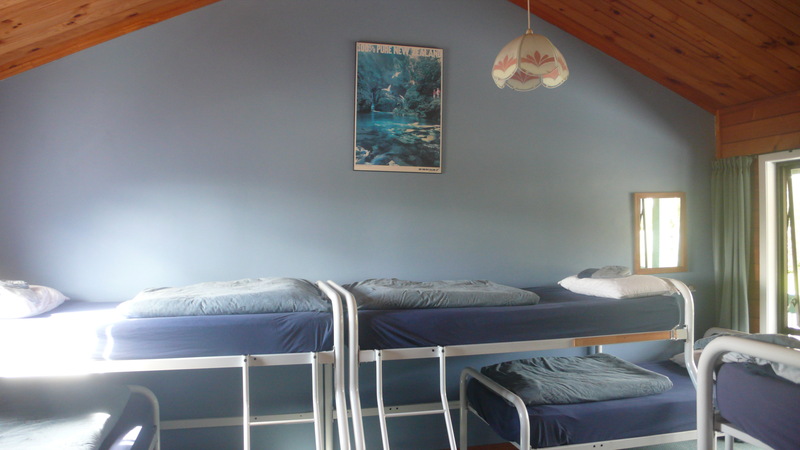 But it was intimidating thinking about staying in a hostel without my partner. I just hadn’t done it before, but it really was, a walk in the park. And I found the more I did it, the more comforting it became. The travelling community is a very tight-knit club and once you’re in it and you meet fellow travel-pals you will feel right at home, I promise. The Whangarei YHA was out of the way a little bit, but I honestly wouldn’t have wanted it any other way….it was adorable. Hidden away on a residential hill, it was the perfect hostel to book into to start my solo travel adventures. It also helped that there was only 3 guests staying there…yep, I’m not kidding. It was very intimate and lovely and I even got a 6 bed dorm to myself! I walked in and met Thijs from Holland, who became a nice new travel buddy (after I bumped into him repeatedly at various hostels), another nice guy from the states and the very awesome Hostel owner Ally. She was so friendly and so welcoming there was no way I couldn’t feel comforted at my first solo stay there. I had done some pre-planning before I arrived in Whangarei to see what I could do while I was there and that definitely benefited, because it’s a small town, so not much goes on here. I found out there were performances going in at the local theatre space in town and so definitely thought it would be worth checking them out. I think after sharing everything with someone else and always having to compromise on what would interest us both, it was awesome to just do something that solely got me excitable. So remember guys, it’s ok to do that, doing solo stuff every now and again is good for you (for both of you in fact!). The first play was called the Rocky Monster Show and I naturally thought it sounded awesome because it seemed to be a combinaton of Frankenstein and Rocky Horror mixed together – amazing! And the next night there was an independent Kiwi play on, called The Intricate Art of Actually Caring. They were both awesome. I was so glad I looked beyond the ‘backpackers norm’ of what to do in a place and found my own plans because they were both really great and interesting performances. The Rocky Monster Show is a classic youth theatre show, which tells the tale of a masked professor who makes DNA moulds of Rock Stars and manages to bring a high-school kid back from the dead as a zombie. It had all the bits of a good musical, the cheesy-high school style of Grease mixed with the humour of Glee and the tongue-in-cheek monster-value of The Rocky Horror Picture Show. I’m a sucker for musicals so I loved it. It was pretty cute seeing all the kids and their families supporting them and it was even better to see the young local talent doing their thing. Indeed, they used a projector and acetate drawings on screens either sides of the stage to set the scene around them, which I thought was wonderfully original. There was even a point where one of the guys stood in front of the projector and the other actor poured food colouring into a glass bowl, placed on the projector, so that all the colours were projected across the other actors face. It was really cool and achieved a sort of lava-lamp effect. The theatre was very small and it was kind of hard to see, so I just stood at the back with my glass of wine to take in the view. 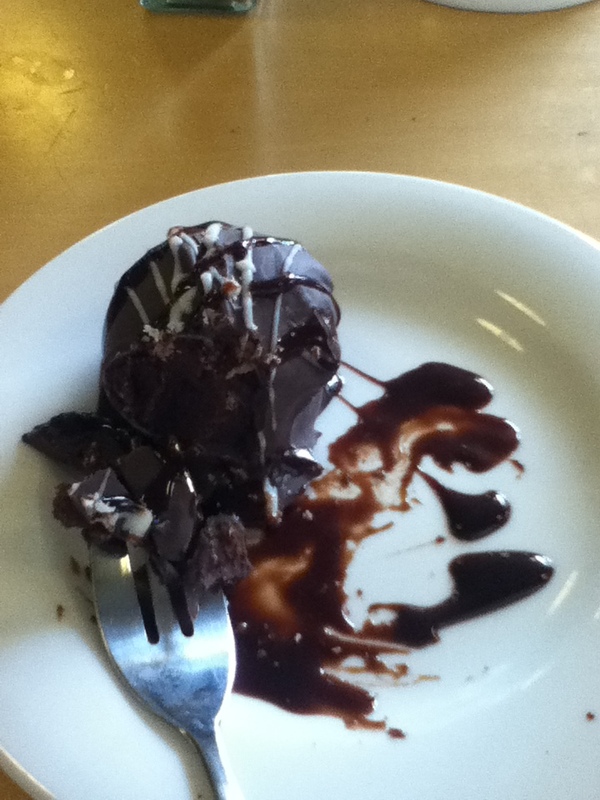 And all I can say is that I loved it. It was a great insight into Kiwi popular and youth culture. As it is a small town, there was only locals in there so I did feel a bit of a imposter, but really it was very fascinating and so, so entertaining. When I wasn’t sitting in the theatre in Whangarei, I also spent time doing a spot of girly shopping and a tonne of walking around the town and into the hills surrounding the hostel. I just really enjoyed looking out at the scenery, this really is a very cosy, sleepy town to visit. You will be hit with a financial condition ‘budgetitus’ as you travel, it’s a backpacker’s ailment that cannot be avoided. You will want to try and find the path to frugal living and maybe even get a little obsessed with it. It’s even a bit fun for a while but then it becomes hard work. You become worried about the pennies over the pounds and by then really it doesn’t matter. It’s true you can’t afford 3 course meals all of the time, but maybe one or two won’t hurt. So remember, you are allowed a treat every now and again….it’s okay, don’t cry about it. Travel time is to be enjoyed too! So eat up! 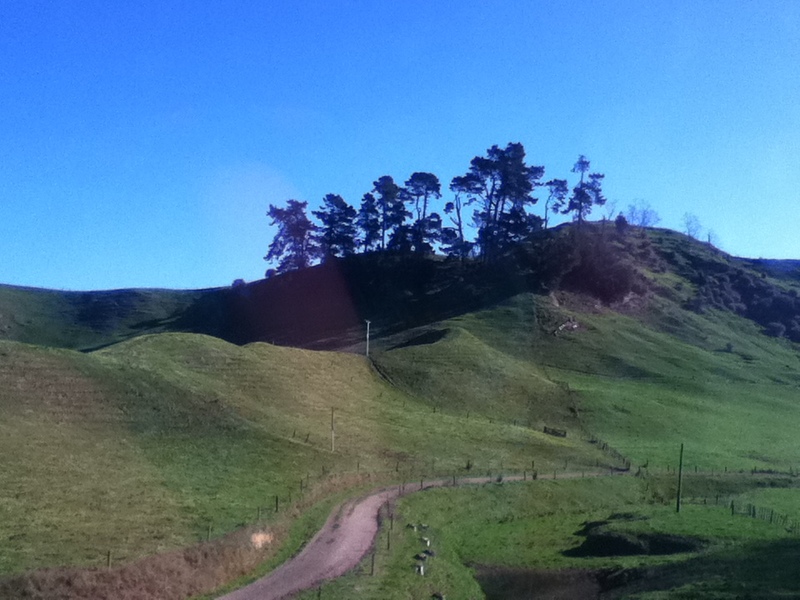 However my happiest memory of Whangarei was going with the guys from the hostel, to see the gloworms hidden in the hills. It was so spontaneous, magical and such an awesome little adventure. We went into the dark with torches and discovered that once you turned them off, the landscape was covered with star-lit glow worms. I was absolutely in awe. I wish I could have found a way to have captured the magic of it all but I would have needed one hell of a camera. It was stunning. So then the next most logical thing to do, in the beauty of such nature, was to have a cheeky smoke and talk about the life, love and the universe until it got too late. Let me just say, it was a very epic evening. If you’re looking for other interesting and yet kooky things to do in town, go to Whangarei Falls. It’s 26.3m high and the pools at the bottom were considered to be sacred (tapu) to the Maori people. The walk to get to the falls is quite a trek, so get your walking boots ready! 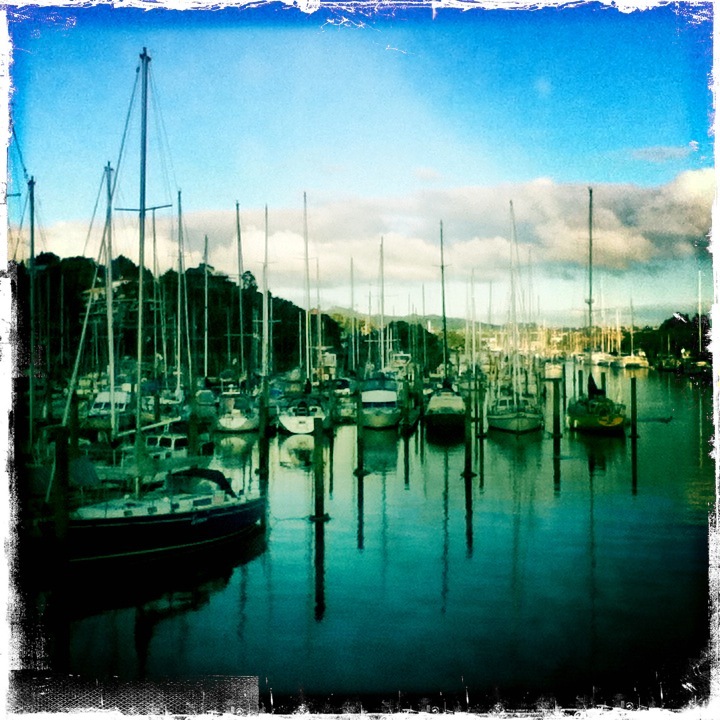 Ever been to Whangarei? Tell me about it? Facebook, Twitter and down below there in the comments section.